May 22 – A Fine Day for Foot/Ankle Recovery! This is a documentation of a recovery from Post Tibia Tendon (PTT) surgery to a left foot & ankle on January 14, this year. Until this past Friday, May 9, this recovery was only about strengthening the ankle. The surgery, subsequent therapy and ultimately purchase of orthotics were all done by The Orthopaedic Foot & Ankle Center, see the link: foot & ankle They are located at 2922 Telestar Court, Falls Church, VA 22042, phone – 703.584.2040. My surgeon was Dr. Daniel Cuttica. Today, I had an appointment to see Dr. Cuttica my surgeon for this surgery. I also saw the Orthotics person, Marsha, in the same office. Last, I went to the blood clot doctor to see if anything further had developed there. Overall, the day began and ended well as far as these three activities went. First I was measured for orthotics. Orthotics are shoe inserts for those who have foot problems, or pain. These orthotics fit between the sole of the shoe and the foot and are made to exactly match the locations on the foot that do not contact the shoe sole on normal standing and walking. The orthotics can be soft or harder and they give somewhat when walking, or doing other exercises. Marsha is the orthotics fitter. She has worked in this doctor’s office for 10 years. For the 20 years before that she was into sports medicine and was a sports trainer for professional athletes. Marsha and I discussed the orthotics. She advised that the new set would have a top layer of thin foam which was not slick like my current vinyl orthotics. 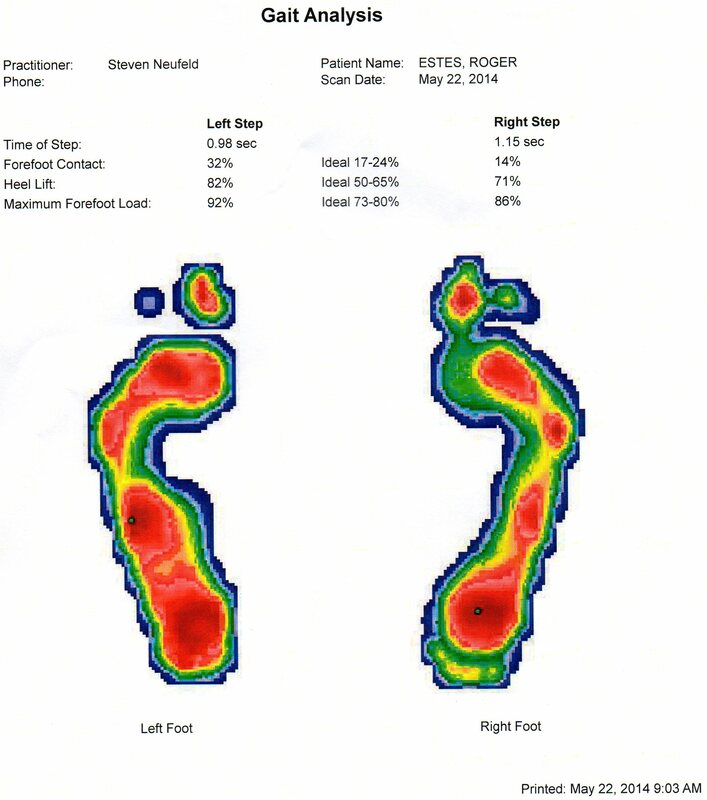 She advised that I would walk back and forth a few times and dependent on how I did she would either use step-in foam or a computer mapping system to determine the contour of the orthotics. 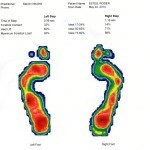 The other information is the percentage of correct gait for both feet. If you look close, on the right heel in the center is a small green dot. Marsha said in a 3 dimensional walk the green ball flows up the foot from bottom to top and shows if the gait is exactly correct or off somewhat and what needs to be done. Marsha said my right foot green dot indicates that I need a bit of lift of the heel as it has too much pressure there. Well, Marsha was exactly right! Currently, I wear my shoes down on the right rear heel. So much so in fact, that with some shoes I have to replace them every 6 months! To get back to my left foot, Marsha commented that the dot in essentially the center of the photo indicated the left foot was correct in walking. Marsha printed the above photo out. She advised I would be able to get my orthotics in about 10 days. We discussed shoes a bit, but not enough to write about here. Next, I went to see Dr. Cuttica. He is happy with the progress. He showed me that the inserted wedges on my foot had healed and the bone had accepted them and grown around the wedges which incorporated them into the foot. I advised Dr. Cuttica the problem was not with my foot, but now with my knee. Dr. Cuttica advised I could have knee replacement surgery in October. Actually he commented that I could have the surgery six months after the surgery!! So if I wanted to I could get my knee done in June. I think that’s a bit soon personally, so October it is. I left Dr. Cuttica then and onward to the clot doctor. At the clot doctor, I received another ultrasound which takes about 20-25 minutes to do. Probably more if there is more area to look at. After that I discussed what was found on the ultrasound. What was found was the same tiny clot but Dr. Arryland was not worried about this. He advised me not to worry about it that it was just a tiny residual. He also advised that in the legs, each vein had a twin that came right beside the other one. So, if there was a problem with one vein the other would take over the work. In this case then, the second vein gets the blood and life continues on inside my leg. So Dr. Arryland gave me a clean bill of health. I’m not to see him again unless I have cramps again in my leg and something swells up. Indeed, this has been a wonderful day for having good things done, and finding out everything is healing correctly! Dr. Cuttica advised me to continue with my exercises even after the therapy was over.